The Fives are located haflway through the Minor Arcana, and continue the cycle of balance and conflict we see throughout these ten positions. 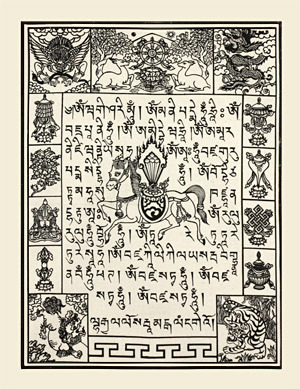 Again, moving beyond what has come previously, we find that the Fives represent a challenge to the balance and establishment present in the Fours. Having an established foundation, we now find conflicts arising and trouble coming to challenge that foundation. Beginning with the Five of Wands, we see conflict, here specifically in the area of authority and guidance. 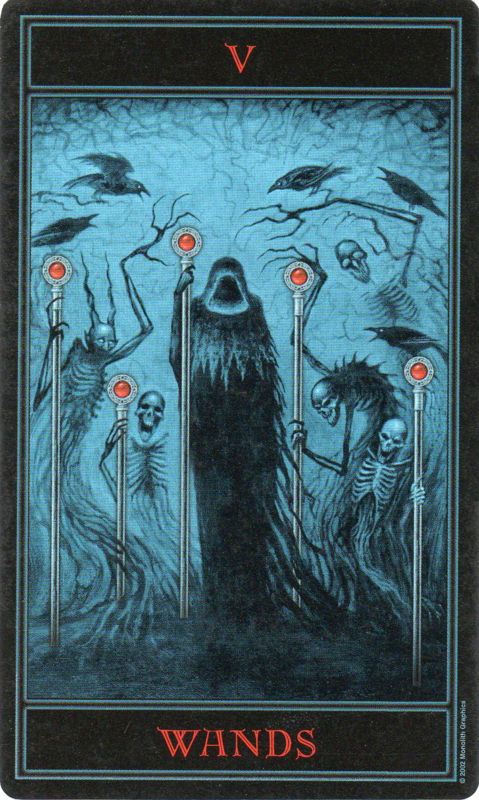 This particular interpretation comes from the Gothic Tarot, and I chose this rendering because, well, it's kind of creepy. Imagine yourself standing on a path, when this goon squad blocks your way. There's a sense here of challenge among them, and this is the message in the Five of Wands. Often showing people engaged in either real or mock combat with staves, this points to internal conflicts. Perhaps, in the instance above, it's uncertainty and fear, or perhaps dissent within a group or organization. The troops aren't ready to mutiny yet, but they're definitely grumbling and challenging authority where they can. But as always, there's a positive and negative side to this. The Five calls for re-examining the current situation, and how these conflicts can be resolved. The negative side of this message is in ignoring those dissenting voices, or failing to take them seriously enough. When this card appears in a reading, it's usually an indication that you need to examine these things early on and meet your own fears head-on instead of ignoring them and letting them grow worse. 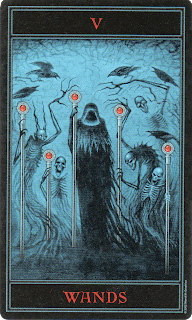 This particular card comes from the World Spirit Tarot, and is an interesting one. Commonly it shows a group of people on a field- several are walking away in seeming disgrace, and one seems to gloat as he collects up five swords from the field. The situation seems to be there was a battle here, and these men lost, thus surrendering their swords to the victor, who almost seems to be calling out taunts after their retreating forms. The card above, however, seems to have a slightly different focus- not on the victor, but rather the vanquished. The swords in the background seem to form a barrier to his way out, back into the light, and also seem to be occupying his mind quite a bit. The Five of Swords is a card of defeat. But there's a difference between being defeated and being beaten. Someone once told me that you're never beaten until you don't get back up again. Remember also that the suit of Swords is tied to thought and reason. How we view this situation has a good deal to do with how we respond to it. Do you consider this defeat the end of the world, or can there be a lesson taken from it? It's true, these lessons are all too often painful, and a wound to the ego is the most painful of all. But notice also that small plant by the figure's hip. It's growing in this dreary place, and seems to be reaching out to the person. It says, don't despair. Sure, you got knocked down. Now figure out why, and figure out what you can do to avoid that in the future. There's also a message here of rethinking where you're going. Sometimes in life we are met with dead ends- we need a new plan. When this happens, we need to have first, the ability to recognize that path for the dead end it is, and second, the mental flexibility to see a new direction. Sometimes the hardest thing to do is look beyond wounded pride, and this comes out in the card as well- we find that the consequences of allowing stubbornness to rule will be even more trouble down the road. The Five of Cups is another one of these mixed-message cards, and also can deal with a sense of loss and perspective on loss. This is the old Rider-Waite image, of loss and trouble. The figure in this card is focused on the three spilled cups- indicating what he has lost. Yet two cups remain upright behind him- it seems all is not lost, and these cups still remain. Again, this card deals with loss and how we percieve it. There's a message here not to let emotion rule the day- when something bad happens, it's very rarely the end of the world, though it may seem like that. What remains, and how can we repair the situation? 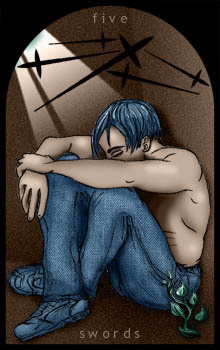 The main focus of this card is on sorrow- it could be a dashed relationship, a failed deal, or just a flat out bad day. The message is, we all have these things in our life. How do we get beyond it? The obvious answer might be by telling ourselves, well, it's not that bad. While true, this is not all of the process. It's also a call to deal with these emotions. If you feel upset or angry or frustrated, deal with and acknowledge those feelings. Then, with a clear mind, go forwards.In its more destructive or negative aspects, this indicates exactly that- not dealing with those feelings, not allowing yourself to acknowledge those feelings, and even more importantly, to put them in perspective. 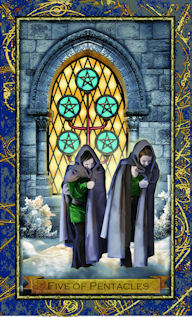 Finally, but not least, we find the next mixed-message card in the group of Fives- the Five of Pentacles. 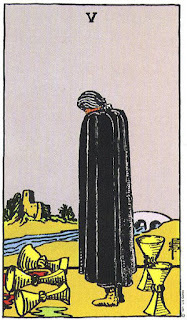 This particular card comes from the Wizard Tarot, and is a somewhat stylized rendering of the Rider-Waite image. It does capture the message of this card very well, though. Here we have two figures, looking very forlorn, put-upon and pretty cold. Behind them we see a lighted stained glass window. The figures seem unaware of this way out of the cold night. This is an important aspect of the card. What it indicates here first, is hardship. Like the rest of the Fives, we see a message of conflict and trouble. From the wise investment of the Four of Pentacles, we see here that things have clearly not worked out as planned. But the message is, when the going gets tough, know where to turn, and know where to find help where you need it. It's also a warning against being too blind or too proud to ask for help when you need it- it requires more strength sometimes to admit you need help than it does to keep pressing forwards. It's interesting to note also that the Fives fall under the Hierophant in the Major-Minor correlations. The Hierophant represents, among other things, a source of advice and counsel. And here we see the message of seeking help and advice, and most importantly, an outside perspective. It's often easy to get wrapped up in our own world and our own thoughts, and, like the two figures above, to miss what's right in front of us. Until next time, keep looking up!